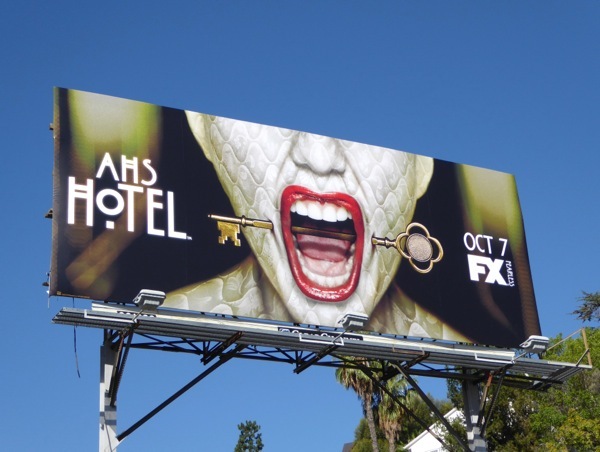 Are you ready to fling open the doors on crazy again and check into American Horror Story: Hotel for the fifth season in the horrifying anthology series? 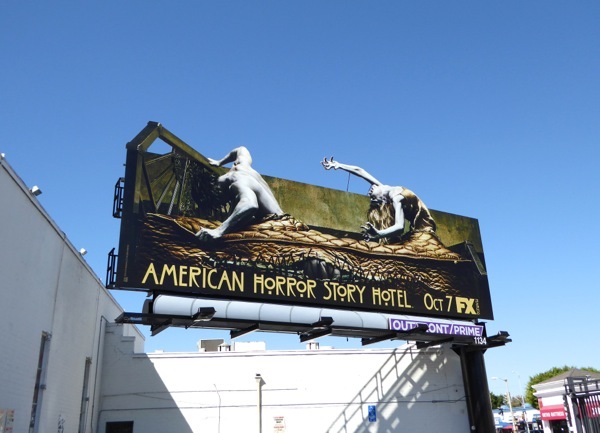 Prepare to be driven gaga, Lady Gaga, that is, and to get you in the mood here are some pretty spectacular billboards for the show filling the streets and skies of L.A. this spooky season. Usually when you take a break at a hotel you're writhing in ecstasy, not agony like these hotel guests seem to be. 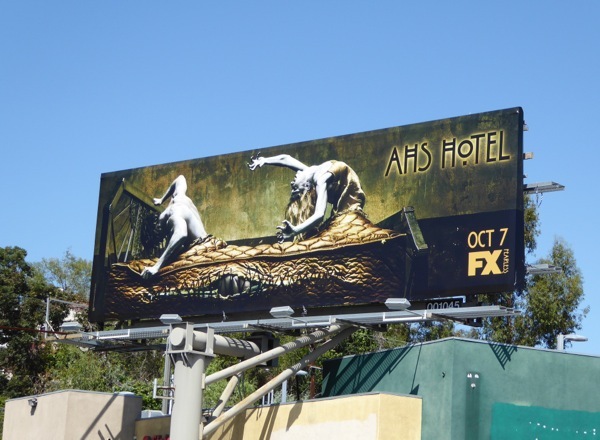 But that demonic mattress certainly makes for compelling visuals this season. 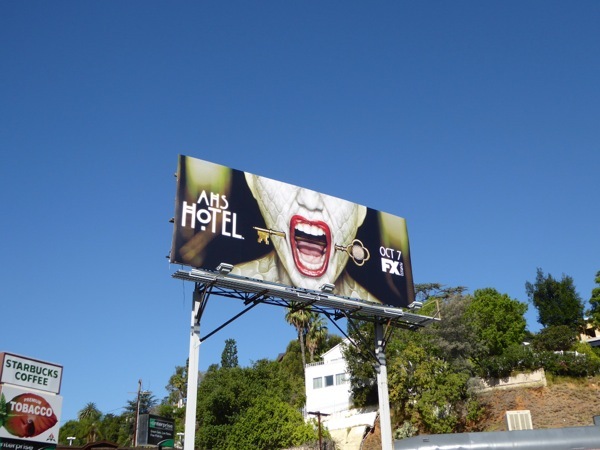 AHS seems to also have a thing for mouths in its promo billboards if you've never noticed and this season is no exception with this arresting key piercing ad creative. 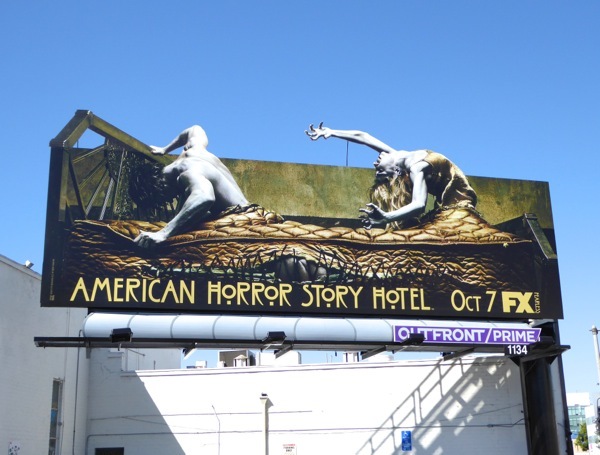 Be sure to also take a look at these previous season billboards for American Horror Story, which feature all kinds of snakes emerging from mouths and screaming clowns. 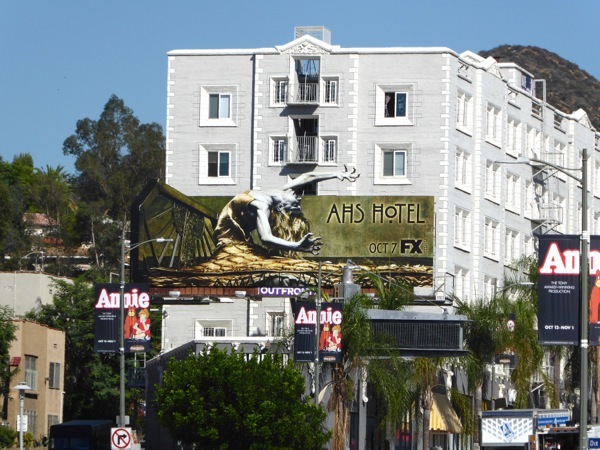 Returning to play with Lady Gaga's blood-sucking 'Countess' in the creepy Hotel Cortez this season are the likes of Evan Peters, Sarah Poulson, Denis O'Hare, Kathy Bates, Angela Bassett, Matt Bomer, Finn Wittrock, Chloe Sevigny, Lily Rabe and more besides, plus fresh newcomers include Cheyenne Jackson, Max Greenfield and even Naomi Campbell. 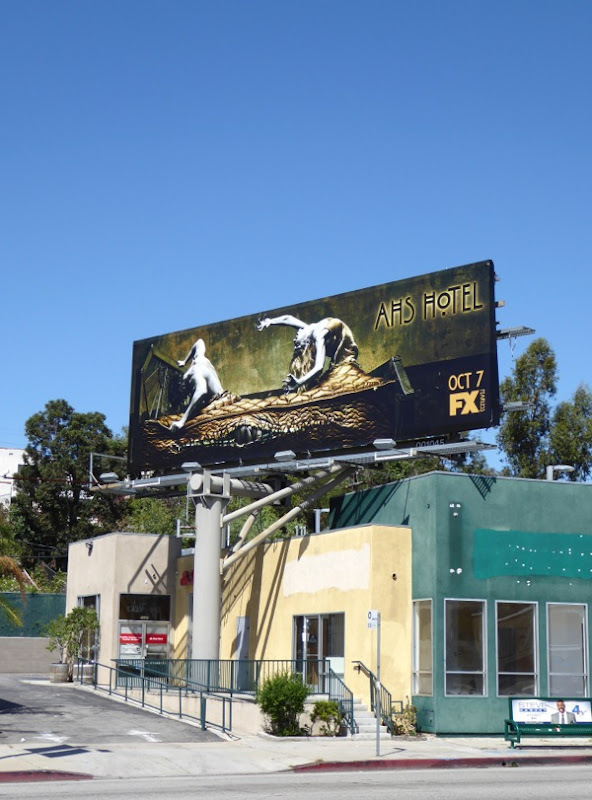 Notably absent from Ryan Murphy and Brad Falchuk's twisted series is Jessica Lange, although Daily Billboard wouldn't be surprised in the acclaimed actress from the past four seasons doesn't turn out in some form or another. 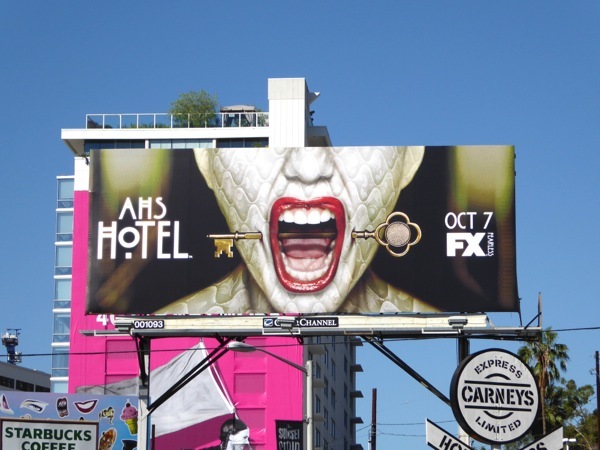 The 'key mouth' ad creative was first snapped along the Sunset Strip in West Hollywood on September 17, 2015. 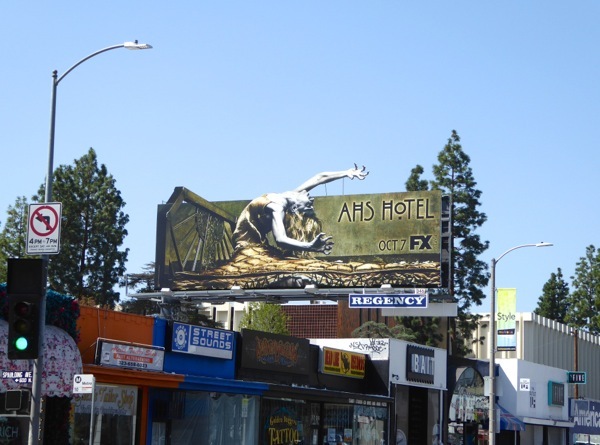 Meanwhile the the special extension 'possessed bed' billboards were snapped along Beverly Boulevard and Melrose Avenue, whilst the standard versions were spotted along San Vicente Boulevard and La Brea Avenue through September 23, 2015. 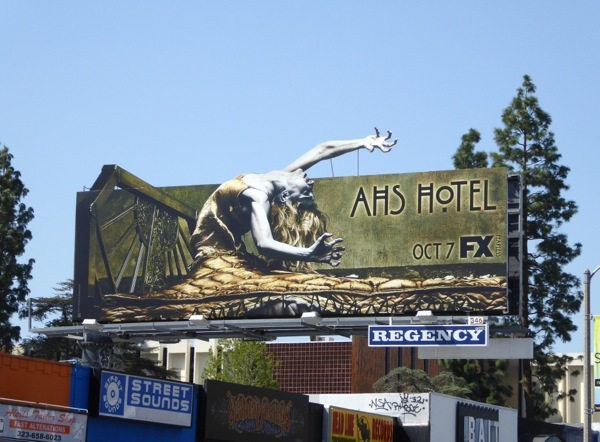 This series has showcased some of the finest horror tropes in the past, from haunted murder houses to killer clowns, witchcraft and demonic possession to serial killers and alien invaders. 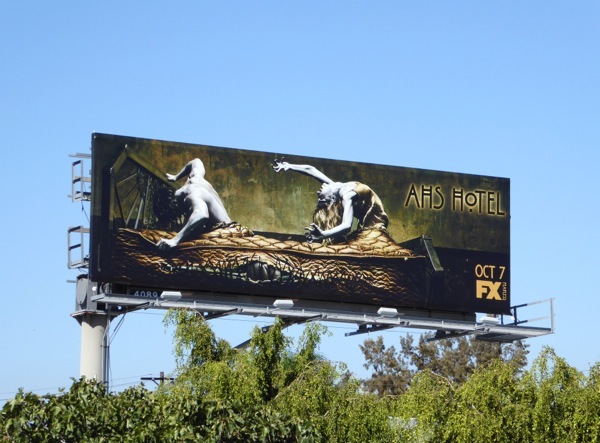 Whatever secrets the AHS Hotel holds this season, we're sure it will provide delights and frights in equal measure. 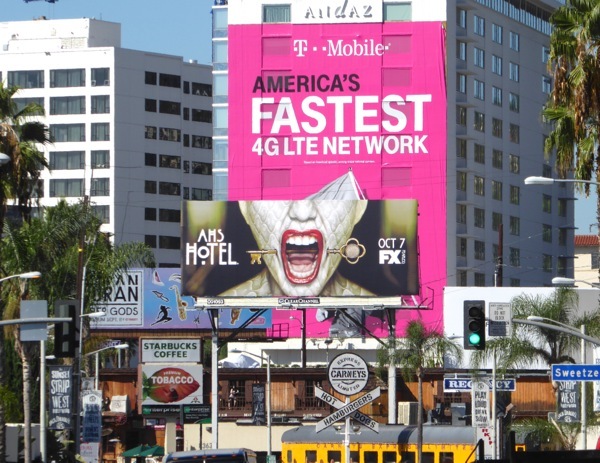 UPDATED: Here's another special extension billboard bringing the AHS Hotel drama to Cahuenga Boulevard in Hollywood on October 9, 2015. 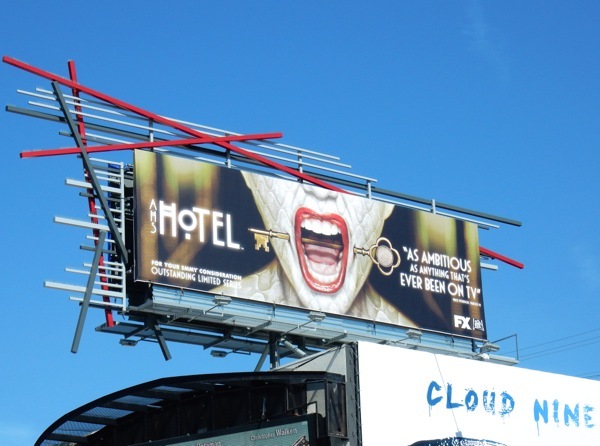 UPDATED: To help garner Emmy support American Horror Story: Hotel had this 'ambitious' billboard for passerby consideration along the Sunset Strip on May 3, 2016.